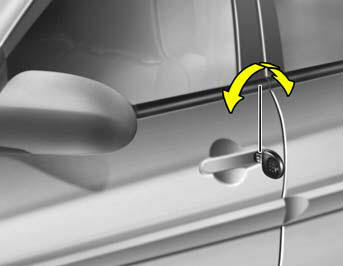 o The driver's door can be unlocked by turning the key once toward the rear. If you wish to unlock all doors, turn the key again toward the rear within 4 seconds (With the central door locking system). o If your vehicle is equipped with a transmitter, you can change the system to unlock all doors by turning the key once toward the rear. If you want this feature (central door unlock mode), refer to the "Keyless entry system" in this section.